On the 30th of January the death took place of Kevin (Buddy) Rock EI5JG after a short illness. Buddy, from Drogheda Co. Louth, was laid to rest in the Old Cemetery, Termonfeckin. And if Buddy was writing this he would say “that‘ll do” for this notice as he was a no-fuss kind of man. Buddy was a car bodyworks specialist all of his life and he took great pleasure in repairing the damage caused when your car fell off the road. He would talk about all the changes over the years as when he started the main part of the finishing of the job was using lead solder bars to fill out the body lines and then an assortment of heat and body files to the job. Having seen his work you would need little more than a heavy coat of primer to finish it for the final painting. On the radio side of Buddy’s life he had quite a lot of radios over the years. He had hands for anything and when he was looking for some aerials to put up he had a look at what some of his local radio hams were using and he said he could make them himself. This was not out of meanest, just the fact that the man had a great pair of hands. One such job he did was to make his own rotator, he acquired a small gearbox with a 99/1 turn ratio attached to a small DC motor via a couple of toothed pullies and a camshaft belt. 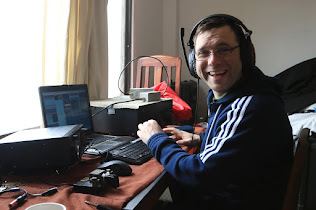 For the controller he started off with making a camshaft lobe out of a chopping board and attached it to the pole then he used a length of throttle cable with one end connected to the lobe the other end ran into the shack. In the shack the cable ran along the celling with the outer part of the cable removed and a pointer attached to the inner cable by turning the rotator the internal wire moved the pointer along the ceiling, he marked on the ceiling some compass settings and some locations so he knew where the beams were pointing - not that any kind of wind would shift it. .